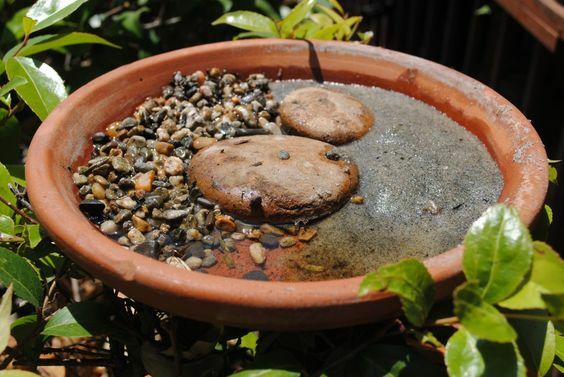 One of the most popular pins on my Pinterest page, is this photo of a puddling station shared from a blog post by The Wildlife Gardener. Butterfly puddling station constructed from a terra cotta saucer with gravel and a couple of rocks on which the butterflies can land to sip mineralized water. • Photo courtesy of The Wildlife Gardener. Many species of butterflies congregate on wet sand and mud to partake in “puddling,” drinking water and extracting minerals from damp puddles. In many species, this “mud-puddling” behavior is restricted to the males, and studies have suggested that the nutrients collected may be provided as a nuptial gift during mating. 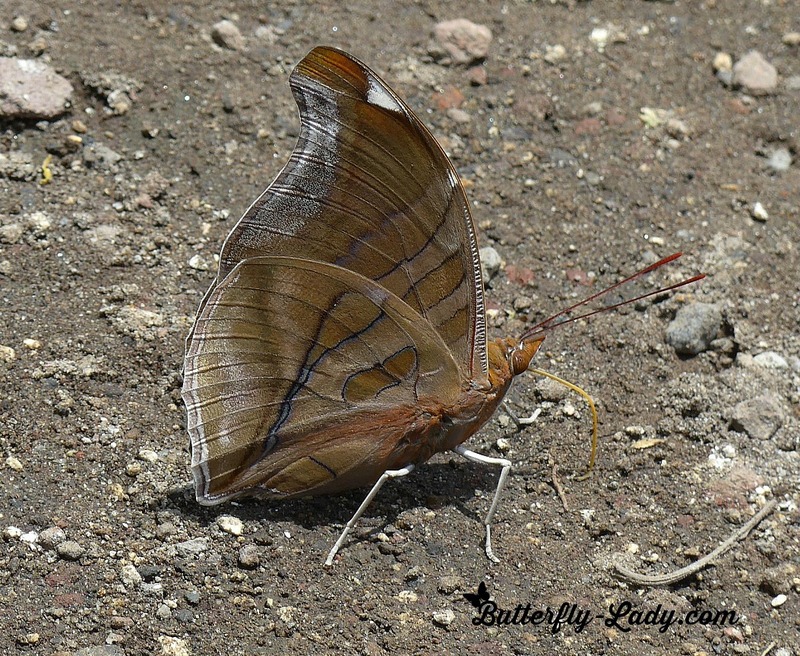 Stinky Leafwing (Historis odius) sipping moisture from wet sand. In the heat of the day, water can help a butterfly cool off. 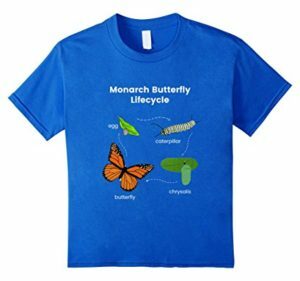 According to Southwest Monarch Study, Monarch (Danaus plexippus) butterflies are usually not known for puddling but, during periods of drought, low humidity and high temperatures, Monarchs are frequently found by creeks and streams seeking moisture. 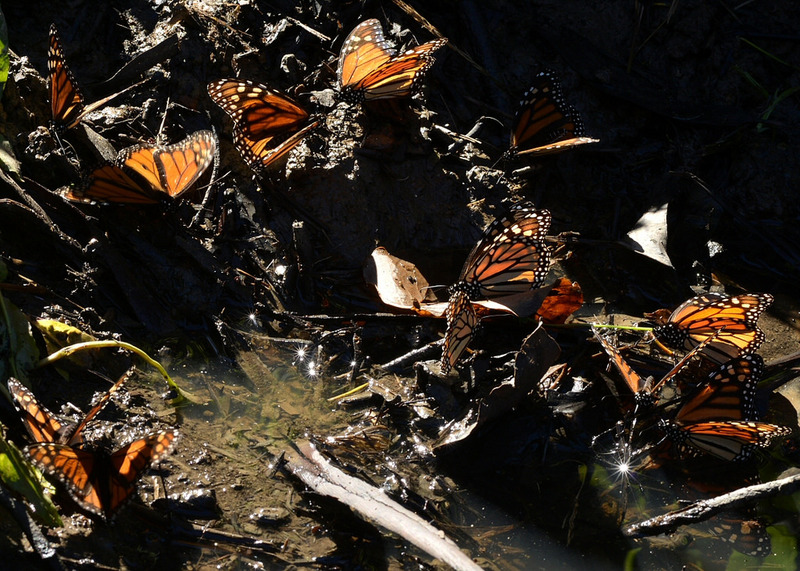 Monarch butterflies puddling in the creek at the Coronado Butterfly Preserve located in Santa Barbara, California, USA. • Photo Copyright © 2016 by Marc Kummel. All Rights Reserved. Used with permission. It’s easy to create a watering station or wet area in your garden for butterflies and need not take much time or money. Front and top views of a ceramic bird bath converted into a butterfly puddling station. Click Here to view an assortment of bird baths for your garden. To get started, you will need a large, shallow dish or container. Use a container at least 12 to 18 inches (30 to 45 cm) wide. I used an extra bird bath that was lying around and placed it right in the middle of my garden. Add sand or course dirt. Sand from the beach works extremely well because it already contains salts and other nutrients. You can also mix some manure or compost in with the sand. 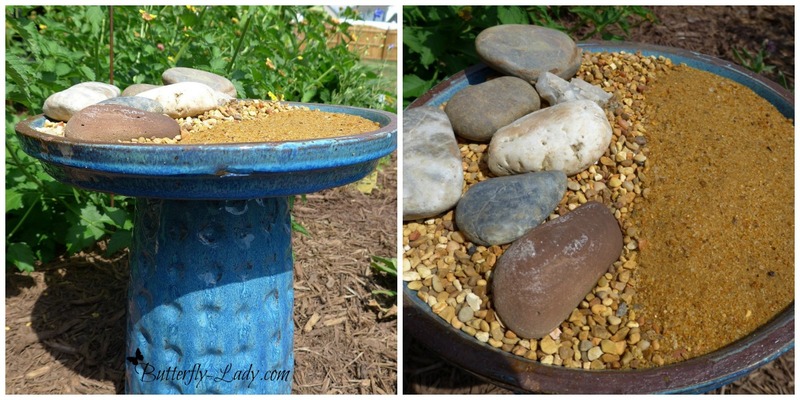 Add a few pebbles and rocks that can be used for the butterflies to rest upon. Click Here to see a selection of decorative pebbles. Keep your sand just slightly moist and do not overfill. Butterflies cannot land on open water. Watch Walter Reeves of the University of Georgia Extension Service build a butterfly puddle and fruit-feeding station in this demonstration video. Click Here to read our illustrated blog post about feeding butterflies fruit. Enjoy making your butterfly puddle. As always with butterfly gardening, if you plant it or if you build it, they will come. This time-lapse photography shows a Painted Lady (Vanessa cardui) butterfly caterpillar shedding its skin for the last time to pupate into a chrysalis. This is part of the metamorphosis that butterflies undergo during their development. In another 10 days or so, it will eclose (emerge) as a beautiful adult butterfly. Video Copyright © 2016 by Wendy Kindred Holt. Used with permission. Thanks, Wendy! Click Here to order Painted Lady Butterfly Caterpillar Rearing Kits. You can experience this same educational fun at your home or school.